We’ve had some truly beautiful days around here lately… sun shining, spring breeze blowing, birds chirping… it’s been ideal spring weather. But the temps are still just a tad bit too chilly to really pull out the warm weather clothing. 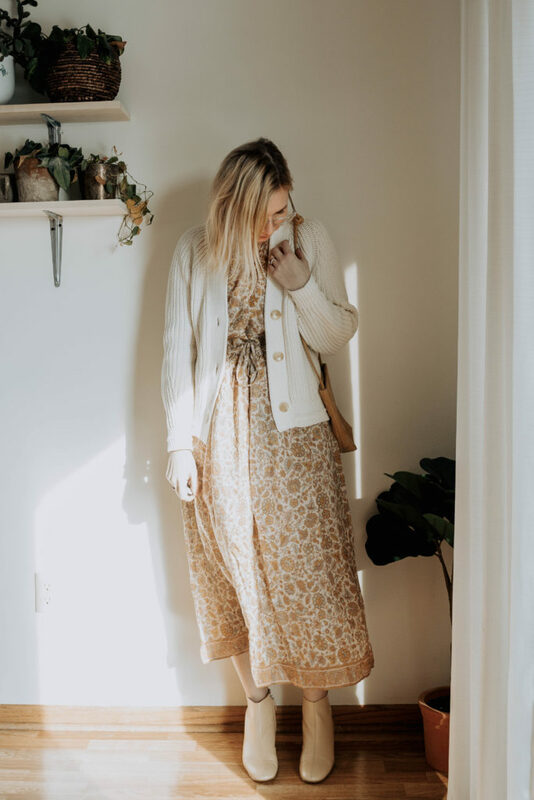 So I’ve been doing a lot of “transitional” dressing to accommodate my spring mood and the still chilly temperatures. 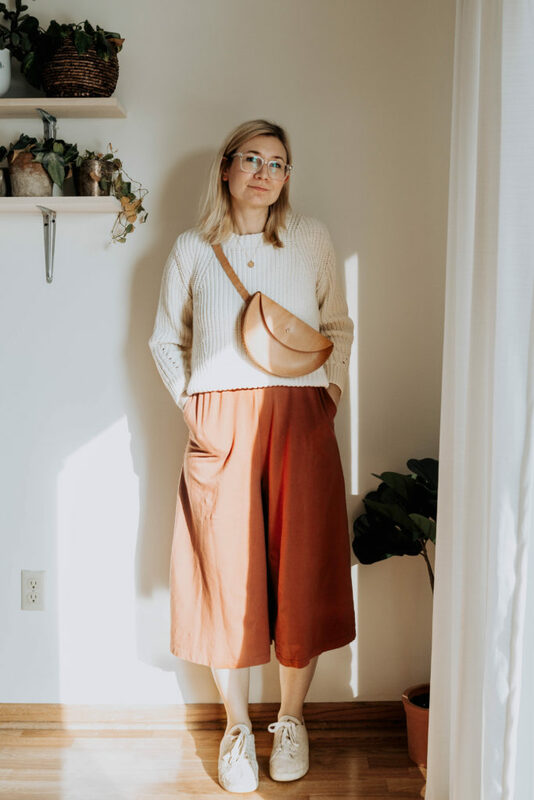 I always seem to get a bit down this time of year because Minnesota is one of the last states to warm up, but I’ve actually been noticing that when I start incorporating spring clothing into my wardrobe my mood is lifted. This is one of my favorite combinations when I’m itching to wear a springy jumpsuit, but it’s still too cold. I know a lot of people think it’s too much of a hassle to wear a layer over a jumpsuit due to bathroom usage issues… but I guess it doesn’t really bother me? I just slip my arms out of the sweater sleeves, and pull down the jumpsuit. Not a big deal! I love this particular jumpsuit for this look because the wide legs almost make it look like I’m wearing a skirt, which I think is a flattering silhouette. Plus, the length of the crop makes it work with flats… sometimes if a jumpsuit isn’t cropped enough, I feel like I need heels for length. Overall, this look is super comfy and I love the springy color palette. This look is my absolute favorite. It’s so dreamy, and the light color palette screams spring while still being weather appropriate (I did wear a pair of cropped leggings under the dress for extra warmth). I’ve been wanting a Christy Dawn dress for several years now, and I was lucky enough to snag this one on Poshmark for half the price… although now that I have this one, I love it so much that I’d be willing to pay full price for it. They just have the loveliest fit, and I feel so soft and feminine whenever I wear it. I can’t wait to wear it with my clog sandals this summer. But really, this look can work with any dress: a simple formula of cardigan, dress, and boots is a sure bet. I’ve been reaching for various combinations of this formula pretty constantly the last couple of weeks. This look is a bit more subdued, but I still really love it! 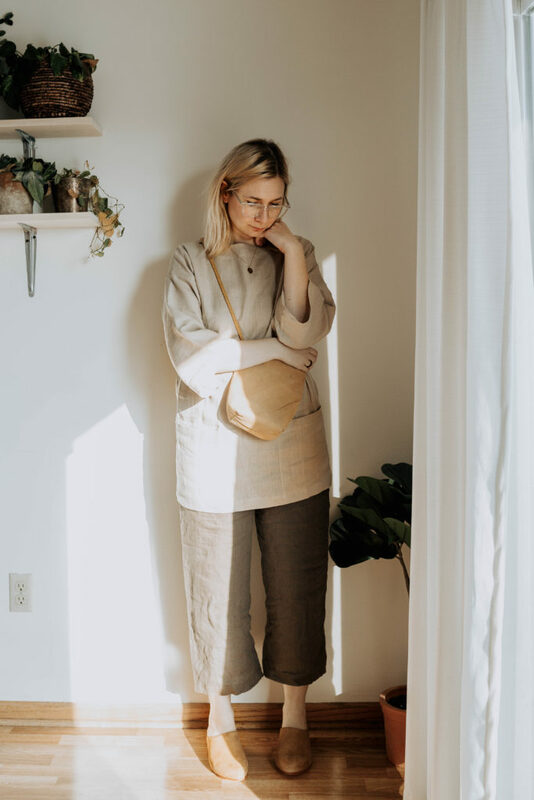 This is the beige version of the black tunic that I wear ALL of the time. I decided to pick up a second color based on how much I wear the other one, and I think this will be really nice for spring. I’ve mostly worn the black one over slimmer pants, but I’m kind of into it paired with a wider pant. I think the slight heel on these mules gives it the perfect finishing touch. These pants are going to be a major go to for me when warmer weather hits. They are SOOOO comfortable… they honestly feel like I’m wearing pajamas. I think they will be super cute with a little 90’s inspired tank top, and slide sandals in a few months. So there you go! I’m hoping that in the next month I’ll be able to get rid of the extra layers, and just full on embrace warmer weather! Are you still in that weird in between weather phase or has it warmed up where you live? What are your favorite transitional dressing tips? Hi! Do you mind telling me what size you got in the tunic? I loved it when I saw it in black on you too! What size do you normally wear and are you happy with the size you got? Thanks so much! I got a small, and it fits perfect! I go between an XS and a S normally, so if you’re between sizes I would go up a size.